Cake jelly is one of the most low-calorie cakes. In the making of this cake you can use any fruits and berries. If you make separate layers of jelly , this cake will look very appetizing. Prepare the sponge cake. To do this, sift the flour by adding starch. The yolks separate from the whites. Put whites in refrigerator. The whisk yolks with half the sugar in the foam. Add the yolks to the flour and stir until smooth. Chilled whites whip to stiff foam, gradually adding the remaining sugar. Gently combine the whites with the dough. Pour the batter into one of the forms and put in a preheated 180 degree oven to bake for 35-40 minutes. For the preparation of the first layer, peel the tangerines. Pour gelatin in a saucepan and pour half a glass of cold water, leave for 10 minutes. Then heat the gelatin over low heat until it dissolves. Attach to gelatin syrup from the peaches. At the bottom of the other silicone molds put the halves of peaches and slices of Mandarin. Pour the chilled fruit jellyinim syrup. Put freeze the jelly in the fridge for 30-40 minutes. Prepare the sour cream layer. Also soak the gelatine in cold water and leave to swell for 10-15minutes. Then heat the gelatin until dissolved. Whisk sour cream with sugar. A thin stream pour in the cream and gelatin mix well. The remaining dogs and tangerines cut into small pieces and add in the sour cream. Cut the sponge cake lengthwise into two parts. 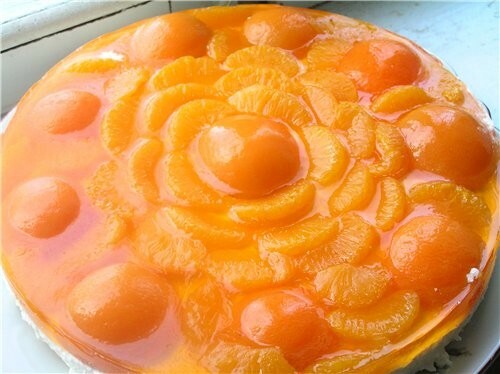 Remove from the refrigerator shape with jelly. Without reaching for the jelly, put on it a layer of sour cream. Then place on the cream layer of sponge cake. Place the remaining sour cream and a layer of biscuit. Leave the cake to harden in the fridge for 1.5-2 hours. Frozen cake gently remove from the mold. Follow the recipe when cooking jelly to the cake turned out not too hard and, thus, well-kept form. To prepare this dessert dish you will need some time on a freezing jelly.